You can visit an important archeogical site which absorbed about 6 000 years from Late Stone Age untill the Slavic Age in 9th century A. C. The continuously uncovered area of more than 5 hectares with 2 hectares explored by the net of probing grooves enabled to gain a comprehensive idea about a spatial distribution of villiges and necropolises in this locality. The villages projecting as the most significant from the sequence of the settlement are: the village with trapezial houses from Late Stone Age from the age of the Culture with stroked pottery (4200 B.C. 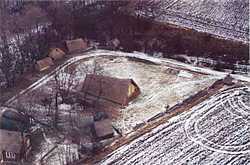 ), the settlement and three burial grounds of Únětice Culture from Early Bronze Age (2200 – 1600 B.C. 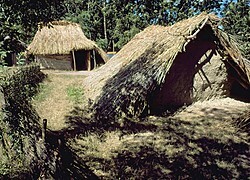 ), the Germanic village from 6th century from the age of the Great Migration , the small Slavic villages from 6th to 9th century. Discovery of two long cult buildings, which have a parallel in region west and northwest of our country (e.g. Brittany and England), was completely extraordinary. After that the work in Březno was focused on an experimental construction of the buildings. March - April TUE - SUN 09:00 a.m. - 04:00 p.m.
May - September TUE - SUN 09:00 a.m. - 05:00 p.m.
October - December TUE - SUN 09:00 a.m. - 04:00 p.m.